Originally from San Antonio, TX. D’jo found his love for the turntable at the age of 18 through techno and breaks. Only, to later change focus to drum’n’bass and start performing in various venues and cities such as Austin, Houston and Dallas. Locally, D’jo alongside Drum Addicts Crew, founded the EDM weekly Switch, at the local legendary rock venue, The White Rabbit. It wasn’t until the fall of 2006 that he would find himself in Minneapolis, Mn. 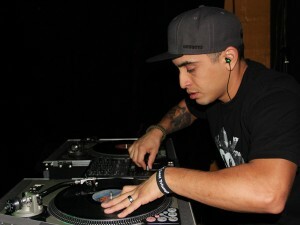 It was here that D’jo would change his focus once again, but this time to hip-hop and turntablism. As part of local hip-hop crew Death Ray Scientific, D’jo was the resident dj for Switch: Open Mic, a weekly hip hop event at the famed Dinkytowner Cafe. Over the years, D’jo has earned co-production credits and features for three albums, multiple mix tapes, toured the midwest, northwest and took a trip back home for a performance in SXSW 2010. Afterwhich, around October 2010 D’jo ran into Natural Nate, was introduced to The-Lost-Art, and SlipMats Radio was born. A dj/turntablism group based in Minneapolis, MN consisting of D’jo, Nimo, Elsewhere. SlipMats Radio was founded in December of 2010 with the intent to dominate the dj scene through the internet radio powerhouse, The-Lost-Art.com. Within two months after its first broadcast, the djs of SlipMats Radio quickly made a name for themselves with an eclectic blend of musical genres with a strong foundation in turntablism. While building their reputation locally with in-store broadcasts at Studiiyo23 and Fifth Element. SlipMats Radio has gained a die-hard fan base throughout the world. Thus, earning them an early nomination as “Best Radio Show” in the 2011 Breakspoll.com Awards. And, with their popularity growing at an exponential rate, D’jo and Slipmats Radio is steam-rolling the twin cities with the support of such sponsors/affiliates as Last Triumph, Breath of Life Apparel, Loud Mouth League, DJ Industries, RANE B&H photo/audio. 1. If you were to order his style in a drink, D’jo would be a dirty rocks glass filled with hip-hop, a splash of juke, a squeeze of footwork, a dash of DnB, shake it with turntablism, then kick it in the side with bass and garnish it with a scratch.